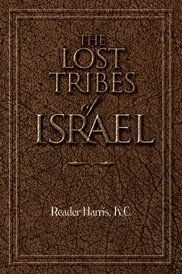 THE LOST TRIBES OF ISRAEL(Written by the founder of the "Pentecostal Movement"
Artisan Publishers is pleased to put back into print an exact reproduction of this forgotten gem from the past. The Lost Tribes of Israel written by the founder of the Pentecostal League in England (circa 1908) can definitely be termed an eye-opening book. The author Richard Reader Harris presents a series of addresses to his Pentecostal brethren proving they were direct descendants of the ten lost tribes of Israel! "We shall find that the Bible declares that Israel exists as a multitudinous nation bearing certain marks inheriting certain blessings doing certain things for which it was created and which it was and is its special missions and destiny to perform." "The discovery and the acknowledgment of the lost tribes would revolutionize the whole world give an impetus to Scriptural study and encourage men in a wonderful degree to believe the promises of God." "If this be true (our Anglo-Israel heritage) it adds tremendously to our responsibilities and opens before us in a way that no human tongue can describe; spiritual possibilities temporal possibilities national possibilities and universal possibilities." Could you be an Israelite and not know it? Could this possibly be so? If so it would mean that the majority of Christendom and the rest of society has misidentified the people most prominent in the Bible. If Israel has been misidentified there is no doubt that major errors in doctrinal interpretation and application of biblical prophecy have been made! Richard Reader Harris (1847-1909) held the prominent and respected position of British barrister and King's Counselor. This was a lifetime appointment that recognized his success and skill in the legal profession. Although an atheist in his early life he became convinced of the truth of the Bible after hearing the Anglo-Israel message. This life-changing experience caused Reader Harris to leave his successful legal career to become a Methodist minister valued Christian leader and author of over 34 books. In 1891 he founded the Pentecostal League of Prayer an interdenominational group which within a few short years grew into the immense Pentecostal movement in Britain. The remainder of his life was spent ministering to the British royalty as well as to the poor in the slums of London. Oswald Chambers a revered evangelist missionary author and close friend of Harris considered him to be one of the "Lord's choicest saints."